First, I have a disclosure to make. I have an MBA from MIT Sloan. I can’t say I had a fab time during these 2 years (far from it). I learnt a lot though – not only about business but also about myself. My professors and my classmates were great. Did it enhance my career? I am not sure. Am I happy to have done it? Definitely yes. Would I do it again? Possibly not. When people come to me for advice whether to do an MBA or not, I am in a really awkward position. I don’t want to discourage them – the fact that they want to do an MBA (and all the sacrifices that come with it) shows they are ambitious. On the other hand, I want to tell them that the reality is not as rosy as it appears on the MBA brochures. So, as an MBA graduate I decided to use a ‘tool’ to communicate this fine balance. 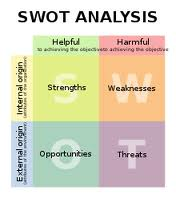 It is called the SWOT analysis. This strategic planning method is used to evaluate the Strengths, Weaknesses, Opportunities and Threats involved in a business venture. An MBA is a significant business venture (financed by you most of the times) and you need to do a thorough research before you embark on it. You are not an expert in anything. Now that you have all these information, it is up to your to make a decision whether to do an MBA or not. The bottom line: There is no doubt that you learn a lot from an MBA. There are many other ways to learn as well. If you decide to do one, I am certain you will ‘enjoy’ the journey. I can’t promise anything though about the destination. Korina Karampela is the founder of b4iapply, author of 2 books, consultant and speaker. She has held senior executive positions in the pharmaceutical industry and has an MBA from MIT Sloan. Her b4iapply blog is among the professional development resources recommended by The Guardian. This entry was posted in b4iapply for an MBA, Career Advice, Higher Education and tagged MBA applications, Should I do an MBA?, SWOT analysis, Why an MBA?, Why do an MBA?. Bookmark the permalink.